Defense and aerospace stocks are finally starting to go down. And that’s good news. In fact, if you are a longer-term investor, this is your wakeup call. In a report to clients April 26, Rajeev Lalwani, a Morgan Stanley analyst, notes the sector is down 6% despite generally upbeat first-quarter earnings results, and guidance increases from leading firms. Defense and aerospace stocks have been on a roll for a very long time. Most started their ascent after the 9/11 terror attacks. That catastrophic event changed the rules of the game. Security became paramount. So much so that spending on very expensive weapons of war has become an untouchable fact of life, even in highly partisan Washington. Decades removed from the Vietnam War, neither political party can afford to appear anti-military. Despite growing inflation fears and rising interest rates due to ballooning budget deficits, there is not even a whisper about curtailing Pentagon support. Democrats and Republicans disagree about almost everything … except military spending. In February, they agreed to $165 billion in additional funds for the Department of Defense. The extra money fully funds the National Defense Authorization Act, a $700 billion package passed by the Senate last September on an 89-to-8 vote. Of that figure, the Associated Press reports $603 billion will be used for core Pentagon operations like missile defense, machinery and buildings. In 2019, the Pentagon budget will rise again, to $719 billion. By way of comparison, the budget was $345 billion in 2002. 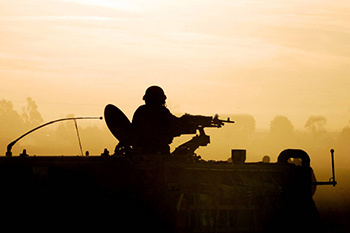 Defense businesses are already starting to see some of the benefits of looser purse strings. General Dynamics (GD), Lockheed Martin (LMT) and Northrop Grumman (NOC) reported first-quarter financial results that soundly beat the consensus view. Lockheed and Northrop even raised guidance. And all of the companies talked about better earnings visibility through the end of the decade. That’s a big deal. Not only should investors expect growth to continue, companies can now plan for it. This will probably mean increased dividends and share repurchase programs. The return of capital is bullish for investors. I’m especially excited about what these companies are doing in space. Aerospace gets very little respect. That’s because for a long time, the space business was terrible. The NASA program was/is widely viewed as broken. And in an age of political budget squabbles, plus the fear of being soft on defense, project cuts became common. • Launch costs have been reduced with reusable rockets. • Satellite technology has been made cheaper by smartphone development. • Demand for bandwidth remains insatiable. • And private investors and national security gatekeepers are funneling money toward new projects at breakneck pace. Most of the buzz is around low earth orbit satellites. Unlike satellites of the past, these devices operate much closer to Earth, at 100 to 1,240 miles. This means higher resolution images, lower latency communication, much lower launch costs and reduced wear and tear on parts. Many LEO satellites use components developed for commercial smartphones and laptops. 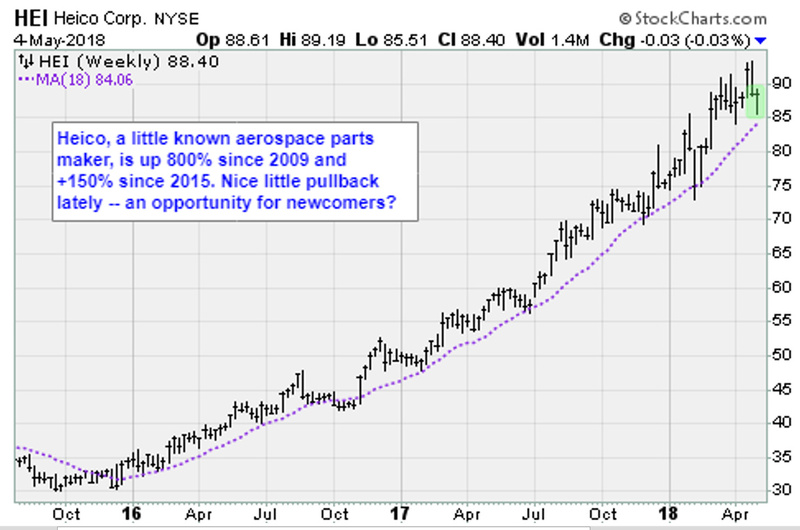 I have been bullish on defense and aerospace stocks for a long time. I recommended them originally for the exposure to increased defense budgets. These days, I’m excited about the aerospace end of the businesses. 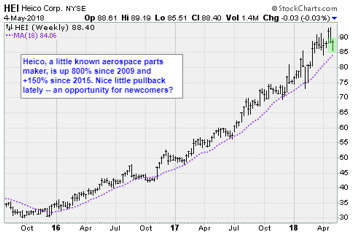 I have been telling my newsletter members to use every meaningful decline to buy leading businesses like Boeing (BA), Lockheed, Northrop and Heico Corp. (HEI). Heico may not be on your radar. It is a smaller company that makes high quality, non-original equipment for the aerospace and aviation sectors. It’s a niche market that Heico is dominating. In this new era of space, its satellite microwave module, and integrated subsystems businesses are booming. The company is growing fast, through continual acquisitions. At the same time, managers have maintained gross margins of 40%, and operating margins above 20%. Since 2013, sales have grown from $1.01 billion, to $1.52 billion. In fiscal 2017, revenues surged 10.8%, far better than the industry average. The stock has pulled back from its record high near $94. It currently trades at $88.40. And that is great news for longer-term investors. P.S. Heico is an active recommendation in my Power Elite newsletter. That’s where I share my top stock recommendation from a small group of stocks that averages $10 million each in new wealth-creation every day. That’s $300 million in total daily profits! Get in on the action here. I understand that military stocks will return profits because our politicians are bought by the military/industrial complex.That does not mean that we should buy them without considering the effect of prioritizing military over healthcare, education, infrastructure etc.. We spend more on military than the next 8 countries combined. Sadly our country hasn’t learned anything from Vietnam where our military killed 3-5 million innocent citizens, or Iraq where we killed nearly a million, or Palestine, Yemen, Libya, Afghanistan etc., etc. If profits are the only guide, look into cocaine. I hear that the profit margins are outrageous.